The Federal Bureau of Alcohol, Tobacco, Firearms, and Explosives has a long history of service within the United States. Originally established as a regulatory and revenue enforcement agency to collect taxes and tariffs on intoxicating beverages and tobacco products, the ATF has grown into one of the most important law enforcement organizations within the United States Federal Government. It's also become a popular career choice for individuals looking for jobs in criminal justice and criminology, leading many to wonder just how to become an ATF agent. Federal law enforcement jobs in general, and special agent careers in particular, often come with higher relative pay and excellent health and retirement benefits. Because of this, ATF agent careers and other federal jobs are highly sought after and highly competitive. That means there will be a lot of hoops to jump through to get hired. It also means you'll have to work hard both academically and physically to make sure you're the best candidate for the job. Hold either a four-year degree from an accredited institution, three years of relevant professional work experience - such as working as a police detective - or a combination of education and work experience. Be ready and willing to work nearly anywhere. Remember, those are just the minimum requirements. Just because you meet them in no way guarantees you will get hired, or even advance in the hiring process. There are several steps you'll have to take. Meeting the minimums simply gets your foot in the door and a chance to participate in the testing and evaluation process. From here, if you have the credentials, you'll progress to the ATF special agent applicant questionnaire, the special agent exam, the pre-employment physical task test, and a polygraph exam and thorough background investigation. One of the first tasks you'll have to perform when you apply is complete the ATF Special Agent Applicant Questionnaire. It is a comprehensive supplemental application that provides the foundation for the pending background check. The questionnaire will ask about past drug use, criminal history, previous employers, and addresses, as well as other information relevant to your character and past performance. 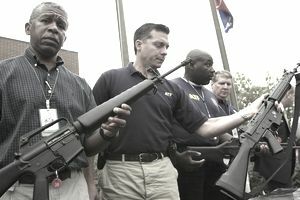 The ATF employs a basic abilities test to ensure its applicants possess the skills and mental ability necessary to the job. The special agent exam is divided into three sections: Part A, Part B, and Part C. Each part measures a different skill. Part A tests applicants' verbal reasoning and will require applicants to read various paragraphs and then answer multiple choice questions based on the information they read. Part B measures quantitative reasoning and requires applicants to demonstrate basic arithmetic skills. In addition to the written special agent exam, applicants will also participate in the ATF Special Agent Applicant Assessment Test. This exam is a psychological assessment that measures your personality and preference. The purpose of the assessment is to help determine candidates' suitability for a career as an ATF agent. If you're not in shape, you need to be in, start working now to get there. Be sure to check with your doctor before you begin any exercise regimen to make sure your body can handle it, and start working on building your strength and endurance. You'll want to work hard to make sure you're physically able to compete. After the physical assessment, it's not over yet. The next step is the oral interview panel, where your communications skills will be evaluated. In addition to the oral interview, a writing sample will also be required, so make sure your English skills are up to speed. It's not all about passing tests. Just because you have the mental and physical ability to do the job, you still need to demonstrate that you have the character necessary to adhere to the high ethical standards that come with the privilege of authority. To make sure of this, a thorough background investigation will be conducted, which will include employment verifications, a polygraph exam and a criminal and credit history check. The dangers of law enforcement careers are everywhere, and agents must be in good health to be able to perform and to survive. Because of this, a thorough medical exam is required. The exam will include a standard physical, and your blood pressure and heart will be checked. You'll also need to submit to a vision test and a hearing test. Your uncorrected vision must be 20/100 and corrected vision must be 20/20 in at least one eye and at least 20/30 in the other. Depth perception, peripheral vision and the ability to distinguish colors will also be tested. Finally, any hearing loss cannot be greater than 30 decibels. If you can advance through the hiring process and receive a job offer, you still have a few more hurdles ahead. All newly hired agents - except for those hired from other federal investigative agencies - must attend a 12-week Criminal Investigators Training Program (CITP) at the Federal Law Enforcement Training Center in Glynco, Georgia. After completion of the CITP, agent trainees must then attend the ATF-specific Special Agent Basic Training. This 15-week program is extremely tough, both physically and mentally, and provides new agents with the knowledge and skills they will need carry out the mission of the ATF. It takes hard work, dedication, and determination to become a special agent with the ATF. Between the lengthy and in-depth job application, the long hiring process, the grueling assessments and the difficult training program, only the best and most qualified candidates will find success in landing one of these exciting and rewarding jobs. If you have what it takes, though, the salary and benefits - not to mention the challenges and rewards of this important career - make it well worth the effort, and you may just find that working as an ATF special agent is the perfect criminology career for you.